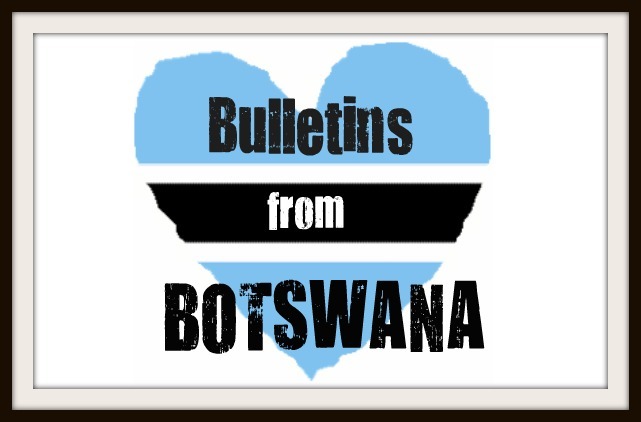 Bulletins from Botswana: What do you value? Throughout the course of last week, I have been truly questioning what holds value in my life. As usual, I went through the day to day activities and learned as much as I possibly could about community mobilization, evidence based planning, correct condom use, personal risk reduction, and emergency action plans. Ironically enough, we also had a session on mental & emotional health right before I received an email I hoped to never receive from back home…. My dad had a stroke last week and has been hospitalized again. Immediately upon reading the email, and directly following our mental health session, I broke out into tears and ran to call back home. What I fear the most is happening as we speak - a loved one is in the hospital and I have no way of helping. It's a horrible, horrible feeling. Luckily, my country director was in Kanye presenting that day so I had the chance to discuss my dad's health with him. The entirety of the Peace Corps staff has been incredibly supportive and I couldn't have asked for a better response. My close friends here (and back at home) have been wonderful help to me as well. Despite all the love , encouragement and prayers, I'm still thousands of miles away from home which is a difficult feeling to overcome. One of my friends here commented the other day about how I have been immediately thrown into the most difficult aspect of serving as a Peace Corps Volunteer… you're simply not able to be around for people at home when you desperately want to be able to show that you care. I've spoken with several friends & family back home about my dad's health condition since then and he has been released from the ICU. They are trying to find a rehab center for him to recover from everything and I'm not sure of the details behind all of that yet either. Please, please send prayers & positive thoughts for my father right now…. I love you so much daddy! I wish I could be there for you. In an attempt to keep myself sane, I have still been attending all scheduled events to distract myself from getting upset. On Friday, we went to the capital to see the Diamond Trading Center and polishing factory. Our group had the opportunity to learn about how diamonds are bought/sold in Botswana and how they affect the economy here. Diamonds are largely responsible for the success of this nation after their independence in 1966, so we were all excited to learn more about the industry. As it turns out, we got to see all the science behind cutting & polishing diamonds from start to finish. People who worked there allowed us to hold some truly incredible diamonds… I even got to hold a 10 karat yellow diamond, valued at $2 million. Can you even imagine having the money to purchase that diamond? We all left with a greater appreciation of the diamond industry and a sickening awareness of how materialistic people can be. A tiny little rock, which looks like a piece of unpolished glass in the beginning, suddenly holds an insane amount of value because of marketing and a high demand for the product. I'm not trying to be a hypocrite either… I definitely own diamond jewelry. It's just insane to hold a piece of carbon in your hands, valued at a higher price than all your worldly possessions combined… and really, it's worthless. I laughed hysterically we asked an employee there she liked diamonds. Her response? "AH! These (pointing at a whole row of diamonds)? No. They are just rocks." What holds value in your life? I know after two months of living in Botswana, my material items don't mean much to me at all anymore. Sure, it might be an inconvenience if I lost them, but like my mommy always says, "If you can fix it with money, it isn't a problem." People everywhere tend to lose sight of the things that matter the most when we are faced with busy schedules and expectations. I'm guilty of it too. And trust me, it isn't a unique occurrence in America either. Kiss your loved ones, give thanks for the necessities in life we take for granted (food & shelter), and remember that life is never a guarantee. My family holds the greatest value in my life, along with my friends. We are, after all, social creatures and relationships are meant to be created and fostered throughout the years. I am truly saddened that I cannot be in Colorado with my family right now, but I know that I can rest in my faith that things will all turn out alright. Praying that this finds you well in your corner of the world. Tate, I am praying for your dad. Hang in there you are such a great daughter. Fortunately he has some of the world's best medical equipment and staff to care for him. I loved this post to keep my perspective right on what's important. I truly appreciate the worker's perspective, "they are just rocks!". Much love from the Pachecos! Osteopathic medical student. Newly married. Colorado native. RPCV Botswana. Yoga lover. Pet mom. The contents of this blog are original thoughts and opinions. This blog is unofficial and not-for-profit. All views expressed are those of the author and do not reflect the opinions, policies, or position of any institution or individual(s) mentioned herein, including the United States government, the Peace Corps, the government of Botswana, or its citizens.